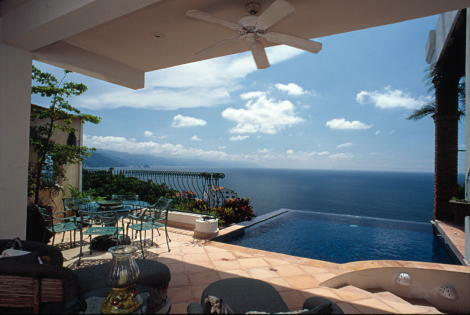 This beautiful 5,000 sq.ft., three story penthouse sits on the hill in the residential Chonchas Chinas area south of the city of Puerto Vallarta overlooking the Bay of Banderas. Each of the four private and spacious, air-conditioned master suites have views of the bay and offer an abundance of romantic ambiance. 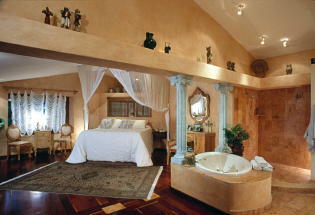 Each suite has a different theme, design and decor. Three of the suites have king beds and the fourth is a private office with a queen size sofa bed, ideal for a teeenager or single adult. 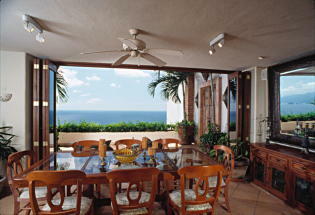 The living room, dining room and kitchen are all open the tropical sea breezes and look out to the bay. 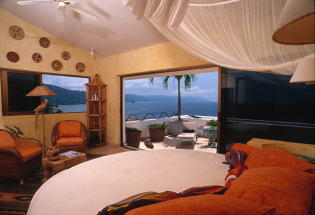 This is a classic example of the Vallarta Lifstyle which is envied by so many around the world. 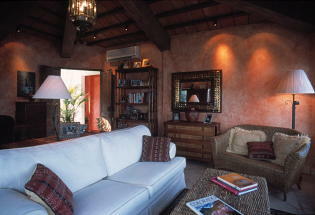 Casa Joanne comes staffed with a maid as well as a houseman and gardener. It features a heated infinity pool, a Jacuzzi in the master suite, a professionally equipped kitchen, purified drinking water, telephone, fax, stereo, and Direct TV.